Folks, I'm going on vacation! I'll resume regular posting on August 13th. 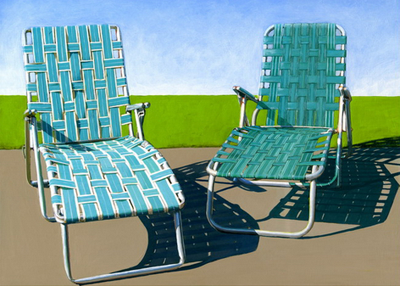 Until then, have a super week and enjoy some nostalgic summery paintings by Leah Giberson. (I own one of her camper prints.) See lots more work in Leah's Etsy shop. I know! When's the last time you sat on one of those lawn chairs? Maybe I was five? Better save them so maybe you can make some gorgeous lamps out of them, like these. Last summer, actually. It's been too HOT for much sitting outside this summer. Aqua Chairs I expected better than that... must be the vacation brain. Enjoy the weather where ever you vacation. Ps. Grandma G, YOU ROCK!!! Ha! I had the orange one as the big image first, of course. But it looked too busy and crazy sitting so close to yesterday's post. So I switched to the calmer aqua, but then ended up adding the extra row of images between them anyhow. Now you know my entire convoluted thought process! Have a terrific time on vacation. Ah, the conversations between mother and daughter. They.are.the.best. It was really very creative. I definitely share your views to my close friends keeps up the good work going. I miss to have a vacation trip with my family.This is the most special moment that I always reminisce since I am away with them because of my work. I love those paintings, they're amazing! Hope you're having a wonderful time wherever you are! I thought those were photographs at first glance! Such talent. Hope you are enjoying your vacation. You have a great blog! the 2nd pic is lovely..i love the chairs..